Don't sugar coat it - make it savory. 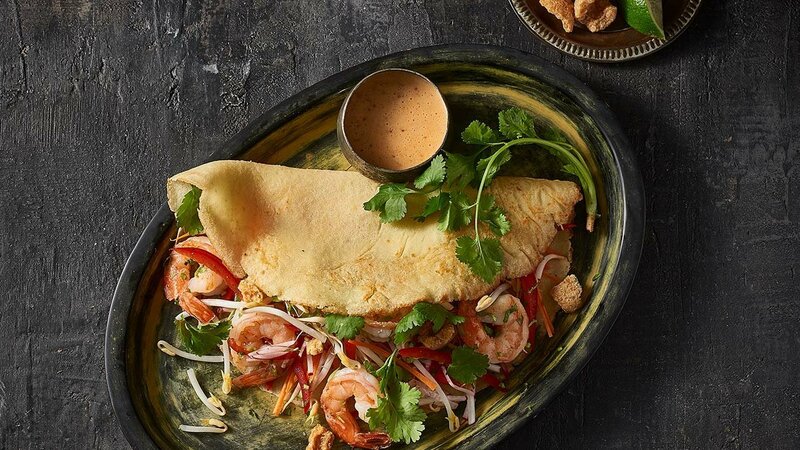 Delicate coconut savory crepes filled with prawns and julienne veg. Whisk all the ingredients for the crepes into a smooth batter. Let rest for at least 30 minutes. When ready to make the crepes, heat a heavy 25 cm diameter sauté pan over medium high heat. Ladle mix into pan and move to obtain even coating. Once brown - turn. Remove from pan and set aside for use. In another pan sauté the prawns with oil and seasoning until cooked. Once cooked lay onto half the crepe and fill with the garnishes. Fold over the crepe and serve immediately.